"Saw Gerrera used to say, one fighter with a sharp stick and nothing left to lose can take the day. They have no idea we're coming. They have no reason to expect us. If we can make it to the ground, we'll take the next chance. And the next. On and on until we win… or the chances are spent." Like Star Wars™ fans around the world, we're eagerly looking forward to Episode VIII. At the same time, we're delighted simply to live in this new age of Star Wars riches. Constantly growing with new movies, television shows, novels, comics, and more, the Star Wars galaxy is larger and brighter than ever before. It's also more diverse. Recent materials have focused on both a greater diversity of characters and styles. And while the Star Wars galaxy was always full of potential for stories of all shapes, sizes, tones, and themes, we're seeing more of them realized than ever before. From the expansion of the classic Star Wars saga presented by The Force Awakens, to the formation of the Rebellion in Star Wars Rebels, to the gritty war genre stylings of Rogue One, there's more here than ever before. 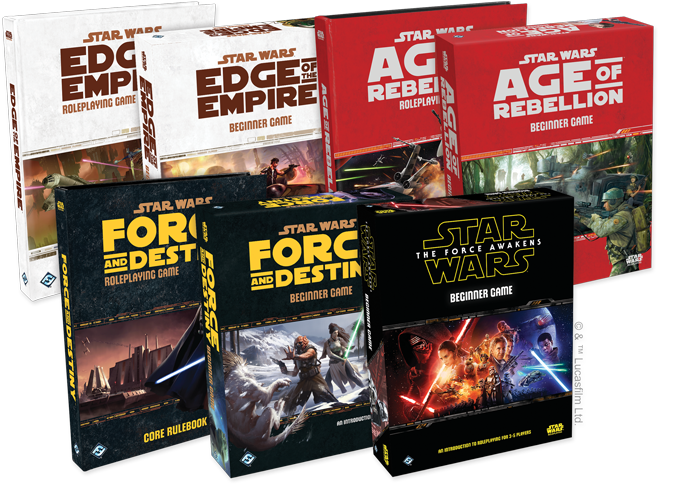 For those of us who enjoy bringing the Star Wars back to our tabletops via Star Wars roleplaying—whether through Age of Rebellion™, Edge of the Empire™, or Force and Destiny™—these stories and styles serve not only as entertainment, but as inspiration for our own adventures. Today, guest writer Bryan Young follows that inspiration toward the pinnacle of heroism—designing adventures in which the player characters may be called to make the ultimate sacrifice. One of the most striking things about Rogue One: A Star Wars Story was its message. At its core, Rogue One was about a group of reluctant heroes who, at the end of the day, were willing to sacrifice their lives to create a better universe that they would never personally see. Watching stories of these ultimate sacrifices are emotional, even heart-rending. A doomed mission has a lot of weight to it, and it takes a special kind of character to embark on a mission you know you’ll likely never return from. If your players are game, though, there is nothing more gratifying than playing a single session or limited series of sessions that are billed from the top as a mission that most likely no one will come back from. There are a number of steps you need to take to make sure your players are satisfied by this sort of sacrificial storytelling, but you and your group will be rewarded for it if you do it right. The first thing you need to think about is what the mission is. Rogue One can offer plenty of inspiration for what the mission could be and how it can work, but you can also peel back a layer of Rogue One and see what sort of movies inspired it. World War II films. The Dirty Dozen. The Guns of Navarone. A Bridge Too Far. Even Saving Private Ryan has an air of futility to the mission you might be able to tap into. All of these films have one thing in common: a team is gathered by the military and given a job they don’t necessarily want to do, but know that it would be good for the war effort. It’s really easy to come up with ideas like this that fit within a galaxy far, far away. The next thing you’ll need to do is talk to your group. Some players get attached to their characters to the point where playing a sacrificial mission might not be appealing to them. Getting the buy-in of your players is really the most important thing you need. The point of any roleplaying game is to have fun, and if this isn’t the sort of fun they want, then you’d do better looking for a different kind of campaign. But if they are into the idea, you’ll need to decide if you’re playing a one-shot or a campaign with a finite amount of sessions. Then you’ll have to decide the mission objectives. For the purposes of this exercise, let's say that the mission objective is to destroy a secret Imperial weapon on a planet that borders a vital space lane to the Rebellion’s cause. The Rebellion needs this space lane so they can use it for a vital rescue mission. The problem facing your characters is that they don’t know exactly where the weapon is hidden. They’ll need to infiltrate the planet, make contact with locals who can get them more information about the weapon, infiltrate the facility, and destroy the weapon so the Rebellion can pass through on their way to an important rescue mission. 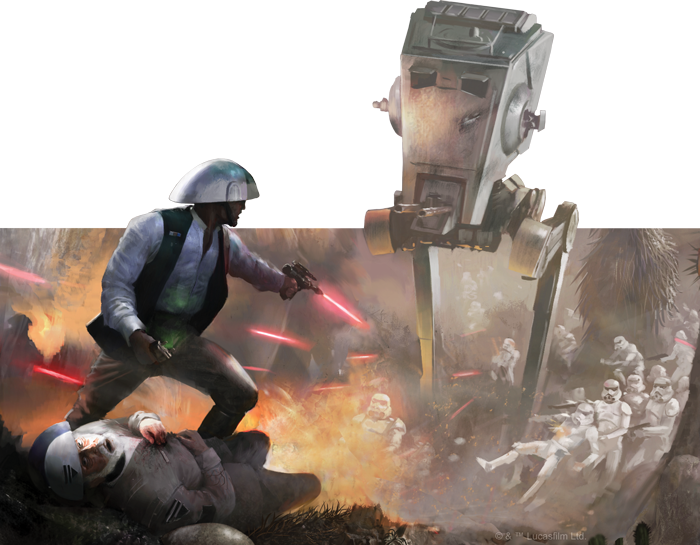 An important Rebel leader has been captured, and another team is leading that fight. If the mission fails, the rescue mission cannot occur. If that rescue mission doesn't succeed, the Rebellion might well be over. 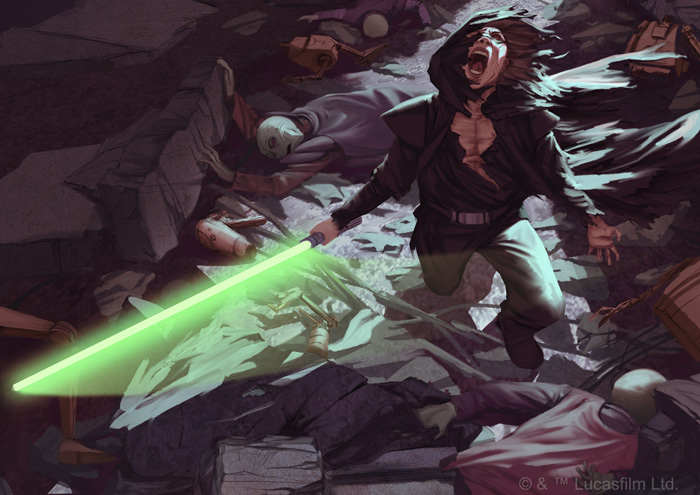 In order to have a mission that keeps your players at the table, ready to sacrifice themselves for the cause, you’re going to need to raise the stakes as high as you can while still fitting your adventure within the Star Wars universe. 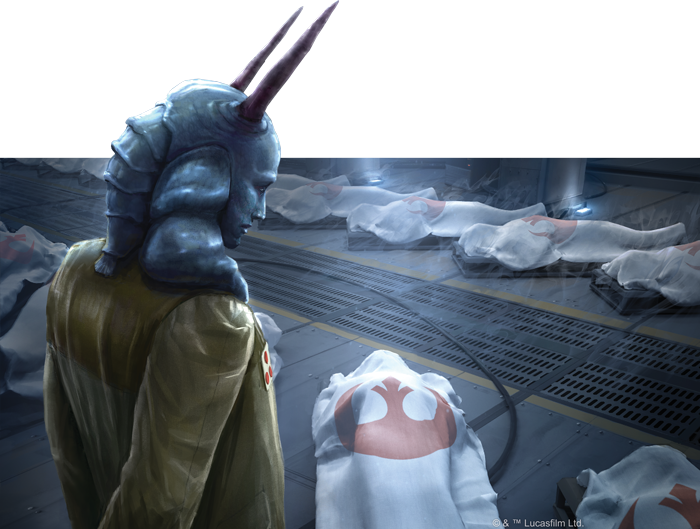 If there’s no cost to the galaxy for the failure of your players, there’s no incentive for them to lay down the lives of their characters. In my example scenario, I’d recommend a three- to five-session arc. The first session would be the initial briefing and the insertion onto the planet and all the danger that that implies. The second and possibly third session would be making contact with the locals and the intrigue involved in actually finding the weapon. The next sessions would cover the actual infiltration and destruction of the weapon. The game ends as soon as it’s destroyed or all the characters are dead. If you’ve planned the session out well enough, those two things will happen simultaneously. They’ll have to give their lives to win. And they’ll be okay with that. Getting everything to line up can be tricky, but the important thing is to plan the adventure so that the characters need to divide their attention between the mission and the enemies, especially when everything is coming to boil. There's nothing more classic to the sacrificial mission than the point where the party is forced to split and some characters willingly throw themselves in harm's way to buy time for the others. Perhaps some of the characters might be able to survive. Getting away isn’t part of the session, though. That’s when the credits roll and your group does its post-mortem on the campaign. With the right amount of planning, it’ll be a campaign that will keep your players talking for a long time. 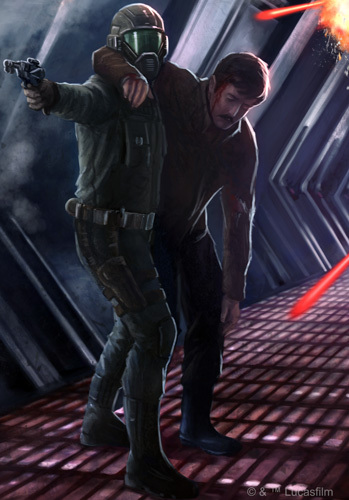 Like Jyn Erso, Cassian Andor, Bodhi Rook, Baze, Chirrut, and K-2SO, your players’ characters could go down in history as heroes of the Rebellion willing to lay down their lives in defense of the galaxy. When he's not making life difficult for his friends' small band of Rebels, Bryan Young is a writer, podcaster, and gamer. He writes regularly for StarWars.com and Star Wars Insider, and hosts the Star Wars podcast Full of Sith. You can follow him on Twitter @Swankmotron. Determine the fate of a long-forgotten secret that could tip the balance of power between the First Order and Resistance! Designed as an introduction to roleplaying in the Star Wars galaxy for players of all skill levels, The Force Awakens™ Beginner Game transforms you and your friends into the heroes of an all-new, learn-as-you-go Star Wars adventure that opens on the arid, battle-scarred planet of Jakku.